Such a friendly woman once I got her to smile. I pass her for weeks in the morning, she walking two dogs and I carrying my mat to yoga. She is tall, with a limp in one leg, but she doesn’t let it slow her down, walks briskly and for miles she tells me, after we say hello and introduce ourselves. On Valentine’s Day, she surprises me with a chocolate bar, passing it to me like a baton in a relay as we move along. I eventually learn that she also swims and I tell her I write for the local paper and give her my card. One morning I am headed in a different direction and I don’t recognize her as she pulls up in a black SUV and parks in front of my neighbor’s house. “You’re early this morning,” she says as she gets out. It takes me a few seconds to see who she is in this different location. And another few to realize she is not stopping to say hello or give me another candy bar. 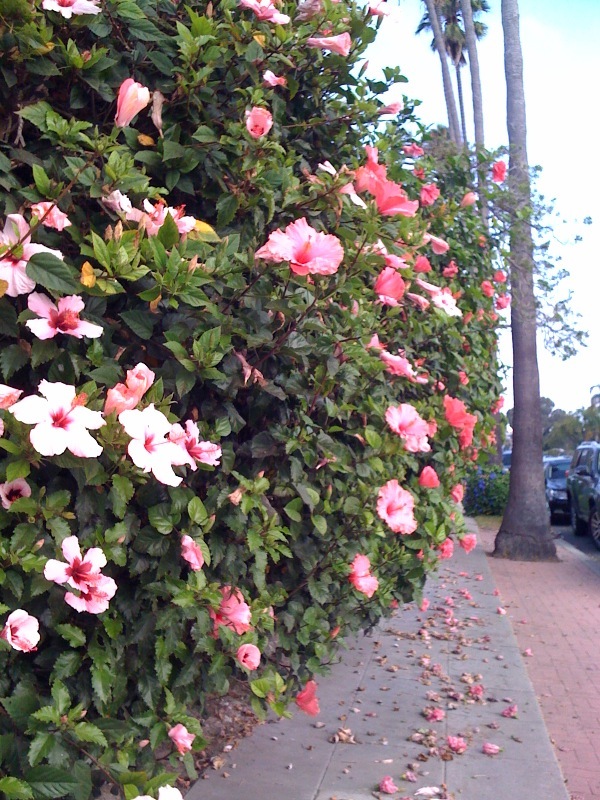 Now, the hibiscus trees and flowers surround my neighbor’s corner house and flow over the sidewalk on two sides, so there are probably enough to feed a bale of turtles. My neighbor is a yoga teacher, a kind and gentle man, and the hibiscus is the state flower of Hawaii, so it seems entirely possible that he wouldn’t mind sharing his bountiful blossoms with a hungry tortoise. I might be tempted myself to pluck one for my hair, just as I’m sometimes tempted to grab a lemon from another nearby front yard. But in the spirit of aloha, I think I would ask first before plucking. Or I like to think I would. I have to wonder: what does a tortoise need with hibiscus flowers? In California, we allow each other space. To be. To grow. Hibiscus or hubris. Is it über cool to take or uber cool to share? If she ignored you, seems she already knew she was doing something “shady” and didn’t want to be seen.